Polling stations have opened in the self-proclaimed republic of Somaliland for the third presidential election since 2003. A VOA Somali reporter in Hargeisa, Barkhad Kariye, says he saw long lines, with some people waiting since 3:00 a.m.
“They wanted to be the first to cast their ballot, people want to make sure they vote before polling stations close,” Kariye said. The electoral commission has urged people to prioritize the elderly and the vulnerable. There are 1,642 polling stations were voters will cast their ballots. Security is tight as Somaliland security chiefs have encouraged the public to go about their business and vote. “We would like to tell the public that the external and domestic security has been secured, they should sleep in peace, do their business in peace and live in peace, we are going to execute our duty,” chief of staff of the Somaliland army General Nuh Ismail Tani said. Tani vowed that army chiefs will serve whoever is elected president of Somaliland. “We are obliged to be obey whoever is elected. Right now we are not sure who is going to win so all three of you have our respect, but we appeal to you to care for the interest of the public and keep the peace,” he said to the candidates. The commander of Somaliland Police, General Abdullahi Fadal Iman, said the movement of the traffic is restricted but borders will not be closed. “The border is only closed to the enemy,” he told journalists in Hargeisa. 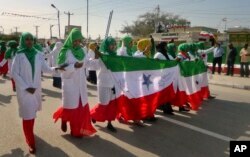 FILE - Women march in a procession to celebrate the 25th anniversary of proclaimed independence in the capital Hargeisa, Somaliland, a breakaway region of Somalia, May 18, 2016. An international team of 60 election monitors are in Somaliland to oversee the election. The observers are from 27 countries including African countries, Europe, Africa, Asia and the U.S. and Canada. “We are hopeful for a peaceful election,” said Michael Walls, chief of the observer team. Somaliland had elections before, but Walls says this election is different from the previous ones. Observers hailed the biometric iris scanning process, which is used for this election, that does not allow multiple registrations. Turnout is expected to be high. More than 700,000 people have registered to vote and all have collected their biometric voter cards. “I would presume that the turnout will be very high because the voter registration process involved the people registering and then picking up cards so they have already shown quiet a commitment to the process,” Walls said. Three candidates are vying to become the fifth president of Somaliland, which seceded from Somalia in 1991 but so far has not gained international recognition. People are choosing between Muse Bihi, a former rebel commander and later a minister of interior of Somaliland, Abdirahman Mohamed Abdullahi Irro, who is the former speaker of Somaliland parliament, and Faysal Ali Warabe, a veteran, colorful opposition politician. Nasir Mohamed Ali is the director of the Institute of Peace and Conflict Resolution at Hargeisa University. “This election has come through different stages, setbacks, delays and preparation, it has come to the finale now,” Ali told VOA Somali. This election should have taken place in 2015 but it was delayed because of droughts and political wrangling and financial constraints. Somaliland officials will block access to social media immediately after 6 p.m. when polling stations close. The blockade will continue four to six days, according to officials. The measure was taken to fight “fake news” and possible circulation of nonexistent results. Observers do not expect the results to be announced immediately. “It will come few days after the election, although it may come as much as a week after the election for a preliminary result,” Walls said. After the preliminary result there will be a window of time when objections are allowed to be launched and if there are no objections then announcement will be made, the preliminary result will be confirmed, he added. “If there are objections they will be handled by the Supreme Court. Constitutionally the president’s terms ends one month after the election, so there is a one month for everything to be sorted out,” Walls said. The fact that Somaliland is holding its sixth election since 2002 is a lesson for countries on the continent and beyond, experts say. Ismail Mohamed and Sagal Mustafe contributed to this report from Hargeisa.